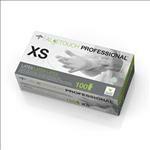 Aloetouch Powder-Free Latex Exam Gloves; MUST CALL TO ORDER . Aloetouch� Powder-Free Latex Exam Gloves are top-quality powder-free gloves with the benefits of aloe vera. � Aloe vera naturally helps moisturize and soothe dry, chapped hands. � These strong, durable, natural rubber latex gloves provide superior barrier protection and are powder-free to minimize skin irritation. � The fully textured surface gives you a sure grip on instruments and dressings. � Ideal for anyone who changes gloves frequently, washes hands repeatedly, or wears gloves for extended periods of time.